UPS trucks are the foot soldiers and the most familiar presence of the outfit, but the real powerhouse in the operation is the firm's aircraft fleet. In total, UPS owns 230 jets ranging in size from Boeing 757s to 747-400s, some of which have ferried everything from a whale shark to an iceberg chunk. The aircraft deliver packages around the globe, but make frequent pit stops at Worldport, where one of them lands roughly each minute during peak operating hours. The facility has a 7.2-mile perimeter and is the largest of UPS' 12 sorting hubs. Though the complex is adjoined to Louisville International Airport and shares its two runways, its size overshadows the passenger terminal. At Worldport alone, more than 2.3 million gallons of fuel are guzzled down by airplanes roughly every three days. So, why Louisville? Simply put: good weather and short travel times. The Derby City has generally temperate weather and is about a two-hour flight from 75 percent of the US population, and a four-hour flight away from 95 percent of other folks in the nation -- key factors to ensure consistent and speedy deliveries. The surrounding area has become a prime spot for a bevy of companies to set up their own distribution facilities thanks to UPS' presence. Zappos and others have set up camp nearby so they can hand off their goods to the shipping titan quickly and ensure they arrive at their destinations as soon as possible. Nikon and Sprint have even partnered with UPS to handle a good chunk of their shipping duties. For example, The Now Network doesn't lift a proverbial finger when a phone is ordered -- UPS takes care of plucking the right handset from its inventory and shipping it off to a customer. Work at Worldport is divided into two "sorts," a daytime and nighttime window where packages are unloaded from arriving planes, rerouted to their next ride and sent off again. Two-thirds of the work is done on the latter shift, between 10 PM and 2 AM. However, preparations begin well before aircraft even touch down. 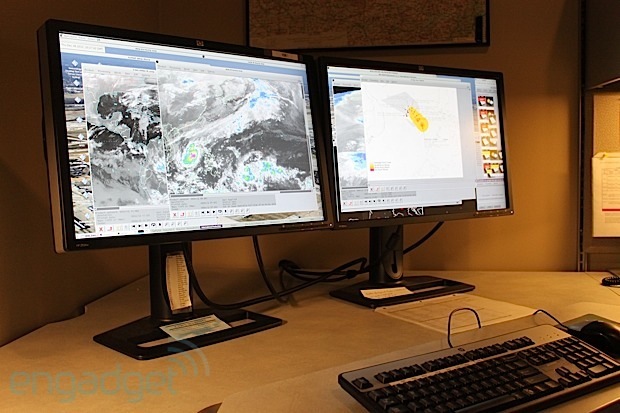 At the company's operations center, employees keep constant tabs on coordinating operations across the globe, including everything from world events to weather. UPS even keeps a staff of meteorologists on hand to monitor potential weather hazards -- snow and fog being chief among them in the winter -- and to prognosticate what could foul up operations, while helping the team adjust accordingly. If the weather, mechanical troubles or other mishaps put an aircraft out of commission, the firm often has roughly a dozen "hot" planes in different locales that are ready to take up the mantle. 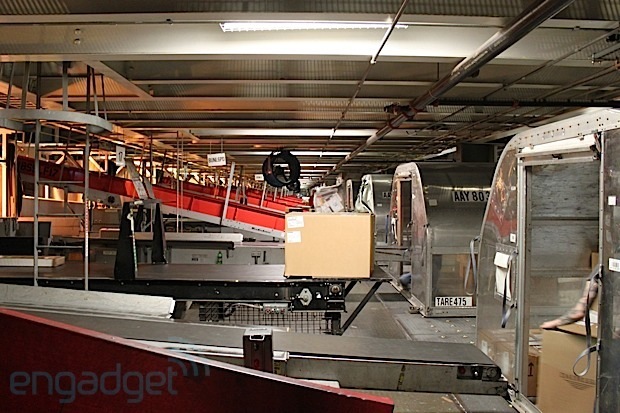 Roughly 2,000 packages were processed on the very first night the site commenced operations in September 1982. 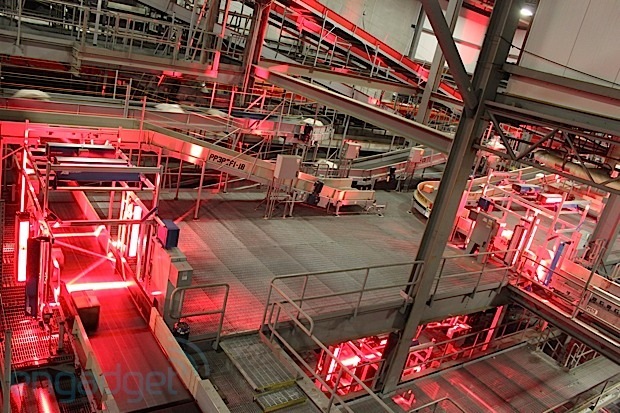 Today, 2,000 packages are processed every 17 seconds. Though some aircraft are serviced out on the tarmac, the majority pull right up to the walls of the sprawling complex. Once sidled up to the building, a crew uses a scissor lift to unload giant enclosures made of Lexan and aluminum, dubbed Universal Load Devices (ULDs), which can weigh up to two tons each. Hundreds of thousands of wheels and ball bearings embedded into the floor of the facility, the lift and even the airplanes make pulling the hefty containers possible for between one and four mortal humans. 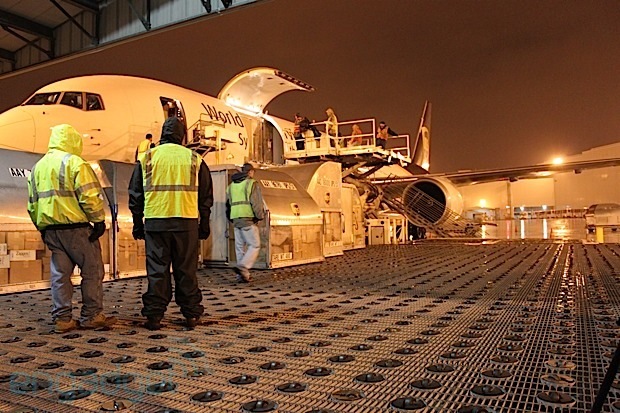 UPS estimates that Worldport is riddled with approximately 1.2 million wheels and bearings. As containers are unloaded, they find themselves at the first step in the sort. A worker at one of 325 unloading nodes opens up the ULD and places packages on one of three conveyor belts: one for small packages, one for larger parcels and another for irregularly sized ones. Hardware above the belt scans the "smart" label ubiquitous on the shipping giant's parcels shortly thereafter. Once a package and its destination are identified, the Worldport system routes it to the appropriate place, all while keeping track of where each item is at all times on the 33,245 conveyors and 2.6 miles of tilt-tray sorters. Since the system has a 20 percent redundancy, packages are dynamically rerouted to the right loading area when part of the building's conveyor intestines fail. If the camera system can't read a label for one reason or another, an image of it arrives at Telecode -- a room lined with desktop stations and employees keeping watchful eyes on screens. As soon as a snapshot appears, workers have 10 seconds to identify the ZIP code so that the parcel finds its way to the appropriate loading area. If neither the scanner nor the Telecode department can appropriately identify the offending label, the package winds its way through the system to be inspected by hand. Just how often is there a kink in the works? UPS prides itself with a 99.9994 percent accuracy rate, but even still, they say that accounts for 15,000 packages that need to be nudged in the right direction for each million. When all goes well, the company likes to say parcels are only touched twice by human hands: upon unloading and loading into ULDs. Packages eventually file down a chute and into another shipping container, which is weighed to make sure the outbound plane is properly balanced. 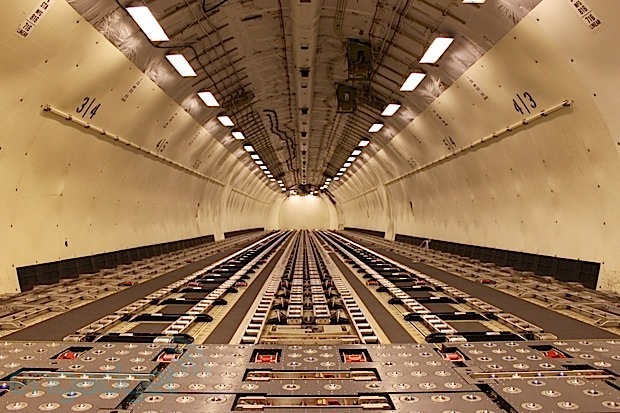 When rolled into position inside an aircraft, containers lock into place to avoid moving about in flight. 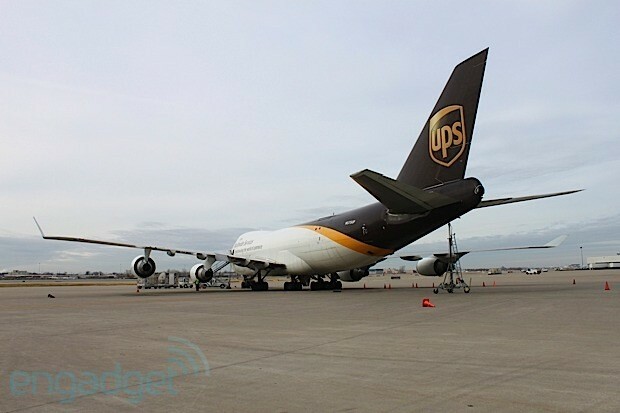 UPS crams up to 39 ULDs in their largest-capacity planes, Boeing's 747-400 and the MD-11. The entire sorting process, from unloading to reloading, takes about 45 minutes when all is said and done. During the holidays, UPS adjusts to the influx of packages and it has a team of 20 number-crunchers to calculate what it'll take to handle the increased demand. Typically, that means hiring an additional 700 to 1,000 workers, leasing more aircraft and 475 extra daily flights at Worldport alone during the busy season between Thanksgiving and Christmas. The company handles 1.6 million packages at the complex in a typical day, but on December 22, 2011 -- the firm's busiest day that year -- it routed 3.6 million to their destination. On its peak day in 2011, UPS delivered more than 27 million packages in total. And 2012? It was projected to be even more hectic. UPS isn't ready to divulge exact numbers just yet, but it expected to handle 69 million online package tracking requests in a single day, compared to its 2011 record of 57 million.